I remember this dish being a regular instalment on the Tower Restaurant menu at South Bank University in the days when I used to type up menus for the day, but it was never anything I had thought of making myself until reading Pille's post at Nami-Nami. Her version looked really tasty, so I decided I just had to have a go myself. The only problem was that I mentioned this to my friends, Natalia and Gosia, making the further mistake of saying I'd cook it for them one day, and now, about a year later, we finally made the date, and I have finally made it. The biggest obstacle to making this in the past is that most recipes I've seen require preparing the Beef in the marinade the night before, so if there is any chance that diners won't appear the next day, one may be lumbered with a large amount of food which will never be eaten. Most stews I make require a good few hours to cook, but with Bourguignon, I figured the overnight marinating was something which really had to be done. 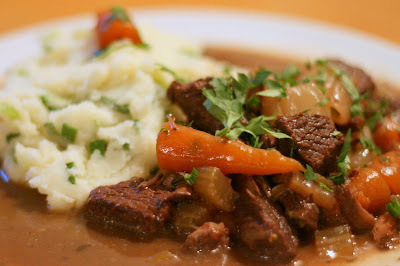 There seems to be a couple of different camps when it comes to making Beef Bourguignon. Some cook the stew the night before, then store overnight and reheat before serving. Others seem to go for either a cold or cook marinade, leave overnight, then, cook for 3 or 4 hours the next day. Gordon Ramsay even has a same day recipe, but that feels like cheating to me. Personally, I went for the cook marinade method, although I couldn't fit it in the fridge, so I just left it near the window overnight. First fry the Onion, Celery and Carrot together in a little oil for about 2-3 minutes. Then add the Wine, Thyme, Bay Leaves, Parsley and Garlic, remove from the heat, drop in the Beef, cover and keep in a cool place overnight. The following day, drain the vegetables and Beef, reserving the marinade. Put the vegetables into a large casserole dish, and pat the Beef dry using kitchen roll. In another pan, add butter and fry the Bacon until golden, adding the shallots about halfway through. Remove from the pan and add to the Casserole. Next, add a little oil and brown the pieces of Beef in a couple of batches in the pan. Remove and add to the Casserole. Now add a little of the reserve marinade to the pan to de-glaze it, followed by the Mustard and Flour, stirring continuously to ensure there are no lumps as you add the remaining marinade and beef stock. Pour, this into the casserole, cover, and cook in a preheated 160 degree Celsius oven for about 4 hours. If you want the gravy a little thicker, you can mix more flour with a little of the existing gravy, then add back into the casserole an hour before the end of the cooking time. Garnish with Freshly Chopped Flat Parsley and serve with Potatoes, Rice or French Bread. In my case, Mash Potato with Chopped Spring Onions was requested, so that was what I cooked. That's a beautiful-looking Beef Bourguignon, Mark! Wow! Thanks Pille! That's praise indeed as it was your post and photos that made me want to make it in the first place! Your Beef Bourguignon was great. We all really enjoyed it! It was worth waiting for one year...:) Thanks. Just found your blog - I love it! That's great looking Beef Bourguignon!